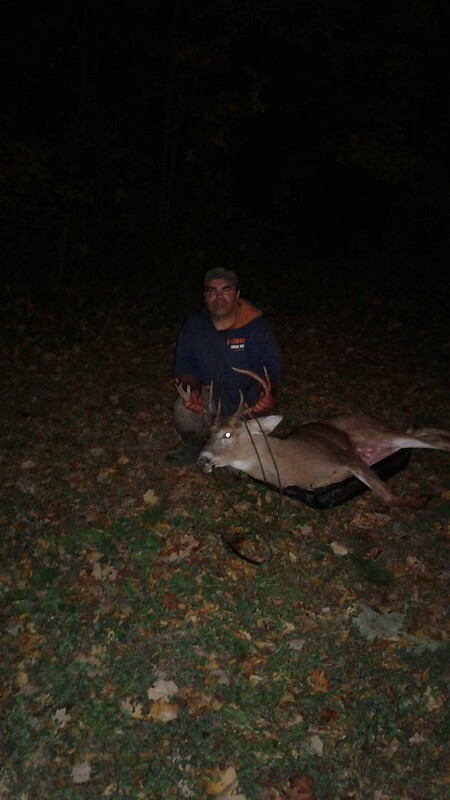 Got this cool looking buck with my Excalibur 335 Micro crossbow…. He took his time crossing the bean field eventually he entered my hay field; he kept on a slight angle coming toward my tree line. After a few minutes he got so close to my tree line (on my right side) that I lost sight of him. Only so far up the tree line you can see…..
After a few minutes and with only about 10 minutes of legal light left I thought about climbing down and looking for him but decided against it (telling myself there is always a chance a deer would come out from my left (knocked down fence area) out of the woods into the hay field)…. a few more minutes go by then I see him along the tree line about 40 yds away making his way toward me. I get excited, hope the wind holds and watch him head my way………….. Interesting as he has his head to the ground grunting…. Pretty cool to see/hear……. (snort, snort, walk head to the ground, snort, snort, snort.. he gets right in front of my stand and I grunt at him to get him to stop for a shot but of course he stops right in front of the only branch (with a couple of leaves still on it) in the way… He turns and starts to walk toward my ladder stand, for a minute I thought he was going to make a scrape right next to it….. But he doesn’t. Instead he just stands there a few yards away looking beyond my ladder stand into the bush…..After a few seconds (maybe 10) he turns and begins walking away toward the broken fence area…. Once again putting his head to the ground and continues with his grunting… He is now quartering away from me at this point, so I grunt him loud, he stops for a second so I take the 12-15 yd shot. At the shot he jumps up, runs right into the fence (falls right over it) gets up runs and I hear what I hope is him crashing in the bush a few seconds later ….I wait about 5 minutes, get down from my stand and make my way back to the truck. I drive over to the area (30 minutes have passed)… I look for my arrow/blood at impact sight, nope, can’t find either one… Make my way to the fence; don’t find any sign of blood there either…start to doubt myself…. Make my way to the other side of the fence, look around and find my first blood, as I am looking around with my phone flashlight (those things are pretty bright) for more blood, I notice antlers about 10 yds away…. So in total he went about 40 yds…. Found my arrow broken inside of him… It was a quartering away shot so it made a big mess of his vitals; As I am gutting him I find my broken bolt/arrow inside of him and the arrow head itself with about 2” of shaft attached, inside his front right shoulder/leg…..
Great replay and photo. Congratulations!